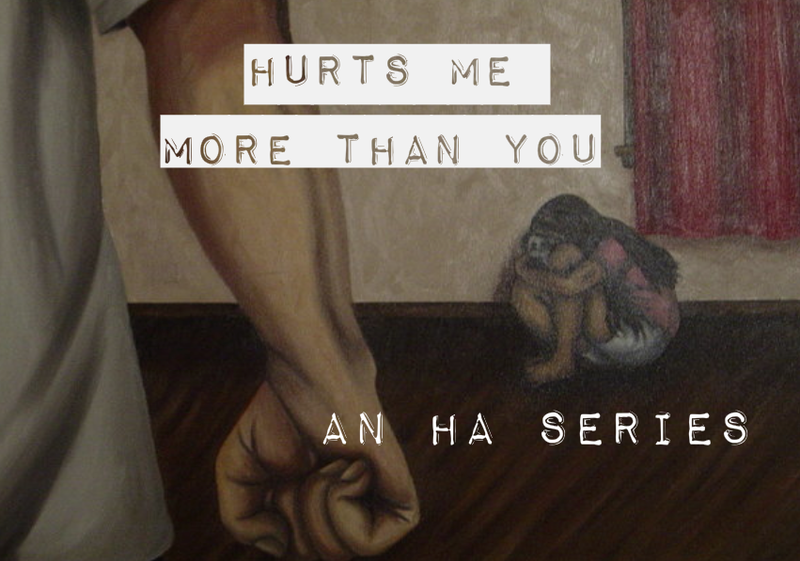 Trigger warning for Hurts Me More Than You series: posts in this series may include detailed descriptions of corporal punishment and physical abuse and violence towards children. My father never hugged me. The only physical contact I had with him as a child was from being beaten. He used the belt that he wore looped through his jeans every day, and he struck me with the leather end enough times to leave bruises and welts. Apologizing for the back-talk or broken object was pointless, I was told, because “it was too late for apologies.” The point now, I was told, would be that I learn from my mistakes. This happened to me, I was told, as young as age four or five because the Bible said that children needed to be trained to respect their parents in order to learn to respect God. I guess the Bible didn’t command that he hug me. Or, if so, I wasn’t ever told that it did. I just wanted a hug when I was a kid. Being a kid is tough, especially when your mother is difficult and has mental problems. I was scared of my father and never felt comfortable showing him things I made. Drawing, poems, dances. I used to hide from him. One time he said children were indentured servants who paid their way with chores until they turn 18. This could have been funny but he never hugged me. My mother would admire and appreciate my creativity, but not my dad. He could be so mean and sarcastic. And it really hurt, especially the threats, because I knew too well what it felt like to be beaten. The only times I remember him being nice was when other people, outside of the house, were around. He was always so much nicer to other people than he was to me as a child. This broke my heart. I can still feel the terror of knowing my words meant nothing and would change nothing. My dad never really told me that he loved me. He would sometimes send my adult self gifts and letters, and it would make me feel weird and guilty. I don’t want things from him. I can’t love him back. I know he’s lonely now and he wants attention from me, but I can’t do it. I just can’t. This kills me. HA note: For more information about Kate Birney, visit Kate’s page at BJUnity. That’s not entirely incorrect although in my case (and my siblings) spanking involved being beaten or hit on any available body part, including face and head. It included getting pushed or shoved against furniture or walls, or getting grabbed so hard that welts were left on my arms. I’ve been hit with rulers, leather belts, the buckle of the belt, metal spoons, wire whisks, acrylic spoons, yard sticks, and of course hands & fists. I’ve been hit for not eating, for eating too much, for not going to bed, for taking a nap, for talking back, for not talking, for being disrespectful, for not taking care of my younger siblings properly, for not making my bed, for not cleaning the house…the list goes on. Always ALWAYS being told “I do this because I love you”, and “this hurts me more than it hurts you”. And also being told that God requires this as discipline. Well, when you grow up from a young age with physical violence being intimately connected to love and religion, it affects how you relate to other people. It makes it hard to believe that people who don’t hurt you DO love you. It makes you believe that when you’re ok and not being harmed, it means no one cares. Rewriting that kind of messed up thinking is a difficult process. And more so, it’s so very hard to unwind and relax. You grow up on edge, never knowing what you’re going to do wrong today that will end up with you being “punished”. I don’t support corporeal punishment. I don’t believe that violence is intended in any religion – I think it’s a misinterpretation designed to control people and outcomes. It leads to isolation because you learn very young and very quickly that the people who are supposed to be safest & love you will always hurt you, so what does that mean for the rest of the people in the world? This makes me very sad. There are some very sick and twisted interpretations of religion and the bible. God bless you both. By God I mean the God of LOVE!